Ten years ago, a Harvard researcher found minority students were far more likely to be labeled disabled in San Diego Unified than their peers. The district has been working to address the issue, but some parents and advocates say there’s plenty more to do. At a school board meeting back in June, San Diego Unified Trustee Sharon Whitehurst-Payne brought up a trend she’d noticed. Whitehurst-Payne was referring to the amount the district spends on special education, which includes everything from special education teachers’ salaries and benefits, aides and therapists, contracts with outside organizations to provide additional services, legal costs and even tuition for students to go to other schools if the district cannot meet their needs. In December 2002, there were 17,007 students identified with disabilities in the district, according to district data. The latest numbers, from December 2016, show an enrollment of 15,189 – and that’s an uptick after special education enrollment dipped as low as 14,434 in 2013. District enrollment overall has also been declining, but special education enrollment dropped at a much faster rate. Between the 2010-11 school year and the 2014-15 school year, district enrollment dropped 1.54 percent. During the same period, the number of students with disabilities enrolled in the district dropped by 11.27 percent, according to a 2016 district report. 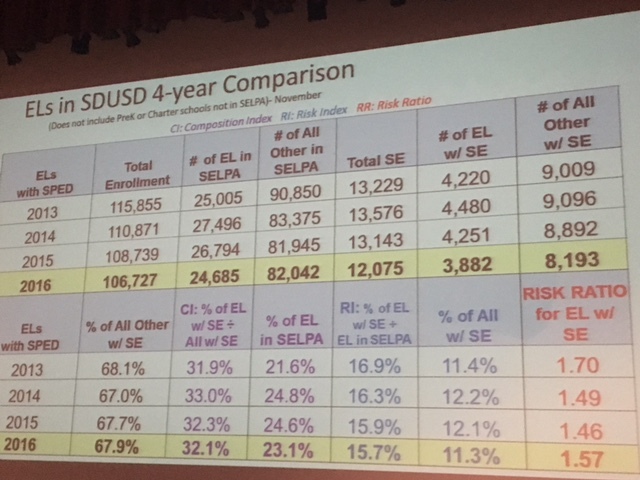 The trend at San Diego Unified is even more pronounced considering school districts statewide are seeing something different: Though their costs are also going up, so is the number of students with disabilities. San Diego Unified, like most other districts across the state, has been pulling more and more money out of its general fund to pay for special education. The amount the district needed to kick into special education to supplement state and federal funds rose by more than $49 million between 2012 and 2016. Ten years ago, Harvard researcher Thomas Hehir found a different problem with San Diego Unified’s special education services: Minority students were far more likely than their peers to be labeled disabled and put into special education classes. The odds that a Latino English-learner would be placed in special education was more than 70 percent higher than for a Latino who wasn’t an English-learner. English-learners were particularly over-represented among students labeled as having a speech or language impairment. Since the report, the district has been implementing practices to ensure it is only placing students who truly have disabilities into special education. Since the Hehir report, the district has worked “to ensure that the disability is not primarily the result of visual, hearing, or motor disabilities, of intellectual disabilities, or emotional disturbance, or of environmental, cultural or economic disadvantage,” said Ragsdale. Part of that involves assessing and intervening at early stages, before students fail or act out, Ragsdale said. The district now uses a system that involves screening students at a young age to address various needs. It might determine that a student could use extra support like a resource teacher who comes in once a week, or that he or she needs to learn the material in a different way than other students. It basically helps schools and the district target specific areas where students are struggling, which might in turn help teachers and staff realize that a student is having difficulties for a reason aside from having a disability. “This increased emphasis has contributed to changes in special education eligibility over the years,” Ragsdale said. The number of students in the district classified as emotionally disturbed has dropped from more than 1,000 to roughly 350 between 2002 and 2016. In the same timeframe, the number of students classified as having a speech and language impairment has nearly halved, from 4,374 to 2,806. The drops mean that the district’s percentage of students with disabilities is now on par with the state average. Other factors might be contributing to the drop in the district’s special ed population as well. Research suggests the occurrence of certain disabilities, like intellectual disabilities, has been decreasing nationwide, which you can also see in San Diego Unified data. Individuals with intellectual disabilities usually have significant limitations in their ability to reason, learn and problem solve (Down syndrome is an example of an intellectual disability). Between 2002 and 2016, the number of students with intellectual disabilities in the district dropped more than 20 percent. Moira Allbritton, a parent who has been involved at the district since the time of the Hehir report and who chairs its Community Advisory Committee for Special Education, said she still has concerns. She said she worries about the district’s financial strains and about the continued commitment to address the report’s findings with all the changes in superintendents, school board members and within the special education department over the last decade. The district’s own data still shows room for improvement when it comes to who is identified as disabled, and what services and interventions students receive. According to the district’s 2016 report, the dropout rate for students with disabilities was 19 percent, higher than the state target and higher than at other districts like Oakland, Long Beach, San Francisco, Fresno and Elk Grove. Students with disabilities are suspended and expelled at a higher rate than other students, and their graduation rates are also low, less than 60 percent. At a special education committee meeting last week, data showed the district is still potentially putting English-learners in special education who may not need to be there. In 2013, an English-learner was 1.7 times as likely as other students to be identified as having a disability. In 2016, they were more than 1.5 times likely. Allbritton said that the district should be analyzing other student groups who might be put into special ed classes at higher rates. Last year, roughly two-thirds of students with disabilities at the district also came from low-income families. If the Hehir report is an indicator, high concentrations of certain groups of students in special education may mean some of them have been misidentified as having a disability.